The short stories in Aetherial Worlds poignantly merge past, present, and fantasy through auto-fiction, essayistic pieces, and allegorical tales. It is the rare collection that defies all of the above with its content, style, forms, themes — everything, really. The short stories of writers like Lydia Davis, George Saunders, Joy Williams, Alejandro Zambra, and Dorthe Nors come to mind. One of the main reasons is that the brevity of the form, relative to the novel, allows greater flexibility and innovation. 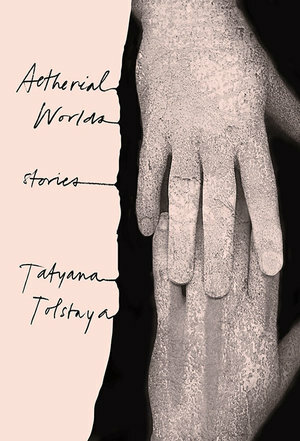 Tatyana Tolstaya's second short story collection (translated by Anya Midgal — please see the note at the end) into English in over 20 years, Aetherial Worlds, belongs to the latter kind. What makes this collection of short stories different from all of the above types is how these stories merge commentary on the past and the present through a variety of styles and forms: auto-fiction, essayistic pieces, and allegorical tales. Due to this, they may not be to every reader's tastes. Yet many themes are deeply investigated: identity, living, dying, loss, loneliness, politics, love, dislocation, the Russian psyche, and more. If further unity is sought, it can be found only in the authorial voice (again, see the note on translation at the end.) Though it ranges from lyrical to acerbic to digressive to journalistic to Russian Literary Master, her voice has its own singular tone — so much so that, oftentimes, a reader might think of a new story as a continuation of the previous one until the character names or setting references prove otherwise. Considered one of Russia's best contemporary writers and cultural and political commentators (from 2002 to 2014, she co-hosted a cultural show on television), Tolstaya is a descendant of famous writers, poets, and translators — Leo Tolstoy was a great grand-uncle, grandfather Alexey Tolstoy was a famous sci-fi novelist, Ivan Turgenev was also a connection. Her work has been likened to several of the Russian greats: Tolstoy, Chekhov, Dostoevsky, Bulgakov, Gogol, and Nabokov. It turned out to be a multifaceted underside of so-called reality, a dungeon full of treasure, an aetherial world through the looking glass, a mysterious box with passcodes to all enigmas, an address book with the exact coordinates of those who never existed. These aetherial visions, mostly of the past, lead the protagonist to become a writer and storyteller. They even stay with her after her physical vision comes back. It's the most important place in the world — nowhere. Everyone should spend time there. It's scary, empty, and cold; it's sad beyond all bearing; it's where all human communication is lost, where all your sins, all your shortcomings, all lies and half-truths and double-dealings emerge from the dusk to look you in the eye with neither disapproval nor empathy, but simply and matter-of-factly. Other physical places/worlds also feature strongly as Tolstaya has traveled extensively for decades. She lived for almost a decade in the US teaching Russian literature and creative writing at various universities. This US experience is prominent in a couple of her stories. The title story is about a Russian academic, very similar to Tolstaya herself and even bearing her first name, teaching writing at a US university and trying to settle into a house in New Jersey. "Smoke and Shadows" has another Russian academic at a US university having an affair with a married colleague but planning to leave him when she returns to her country. In both of these stories there are shades of the neo-Gothic as the narrators wander back and forth between past, present, and fantasy. Both also have a lot to say about East versus West, socio-cultural stereotyping, and the immigrant's sense of permanent dislocation. That sense of dislocation is also evident in essays about Italy and Greece. In "Without", the narrator imagines a world where Italy had never existed and shows how the entire history of the world would have been different. In "Faraway Lands", we get sharp impressions of Crete's ancient beauty and present-day Greek culture — all told with an affectionate wryness. Fiction about Tolstaya's own younger days shimmers with the most vivid, cinematic images. "The Young Girl in Bloom" (published in Zoetrope: All-story) is about a student who works as a telegram deliverer in Leningrad. It's as much a coming-of-age tale as a series of glimpses of a Russia long disappeared. "The Invisible Maiden", about the narrator's childhood dacha, is filled with so many people that they begin to seem like fantasies within fantasies or a nest of Russian dolls where the story of one leads to the story of another and another. Both of these also have touches of Chekhovian simplicity and Gogol-esque surrealism. The two allegorical tales, "Judith With a Sword" and "The Window", are reminiscent of the Russian Symbolist movement in art and literature. In the first, a man falls for a statue of a woman with a sword, spends all his savings on it, and loses his family. The second is about a magical window that gives random gifts to the protagonist, which he thinks are free until he discovers, shockingly, otherwise. Windows and doors are often portals in fiction about other worlds. In addition to the above story, they appear as symbols and props in a few other stories here, too. For example, in the essayistic piece, "The Square" (published in The New Yorker), the window is represented by an abstract painting of a black square. Through the work and its artist, Kazimir Malevich, Tolstoya dives into a rather winding exploration of art and abstraction. Along the way, she inserts another real-life personality: Leo Tolstoy himself, having the biggest existential crisis of his writing career. Indeed, real-life people pop up as literary characters a number of times. "Swedenborg" is a biographical essay about Emanuel Swedenborg and all his eccentricities. In the final story, "See the Reverse" (published in The New Yorker as "See the Other Side), Tolstoya writes about her own father in a part-fictionalized narrative that involves a Roman mausoleum, annoying tourists, a blind man, and the beauty of an ancient mosaic ceiling. In "Father" (published in The New Yorker), a dead father shows up in dreams as a young man dressed quaintly and with tips about the afterlife. Two more essayistic pieces, 'Aspic' (published in The New Yorker) and 'Passing Through' (published in Lit Hub), are about seemingly ordinary, domestic activities — the latter about socks getting lost in the dryer and the former about making a Russian dish, recipe included. Both turn into meditations about the larger world and beyond. Yet, an incisive, sardonic humor makes them engagingly vibrant all the way through. The most memorable essay of all here is 'Official Nationality', where Tolstaya gives us the three main things that make up a Russian psyche. The last of these, "let's hope", is the most dominant. She describes it at length, alternating between sarcasm and satire and summarizing, "This 'Let's Hope' is a built-in denial of causality, it's a lack of belief in the material nature of universe and its physical laws." After a hysterically funny diatribe, she ends with a somewhat kinder understanding: "And so he doesn't expect a code of conduct, he expects Grace, for that's what Grace is — a manifestation of goodness and benevolence perpendicular to all probability and merit. Just because, by virtue of the Lord's wanting it so." DT: I love the parallel in the story between the blind man being told about beauty and the tourists being told — through the mosaics — about Heaven. Are you implying that it's impossible for us to experience directly — without intermediaries — the most important things in life? Can we never truly see the other side? TT: For that matter, there is another intermediary as well — me. Think about that woman who tells the blind man what she sees. She is the "eyes" of the blind man. She becomes a writer, a translator of a sort. How well the blind man sees the world depends on her. If she is talented, he feels things. (I hope that she is.) We all encounter writers, translators, artists — they tell us things. Without them, we are locked inside ourselves. We don't know what's on the other side. We can only guess. Sometimes there are others who try to tell us what they see; sometimes it's we who tell them. If we think we know the "truth," or even a tenth of the "truth," let's do our best to render the "truth" truthfully, beautifully: there are so many blind souls without guidance! All we can do is do our best. A note on the translation: Anya Migdal's name, as translator, is not on the cover of this book. There's hardly any promotion or publicity content, e.g., interviews or profiles, of her work. This lack of recognition of translators needs to be pointed out each time it occurs. Literary translators work hard for little-to-modest compensation. Given the wide-ranging prose forms and styles of this collection, Midgal has pulled off a highly admirable feat in maintaining the integrity and rhythm of the author's voice. She deserves to be recognized appropriately. In fact, as translator, she's also one of the important intermediaries Tolstaya talked about in that New Yorker interview above — "rendering "truth" truthfully, beautifully" for readers.